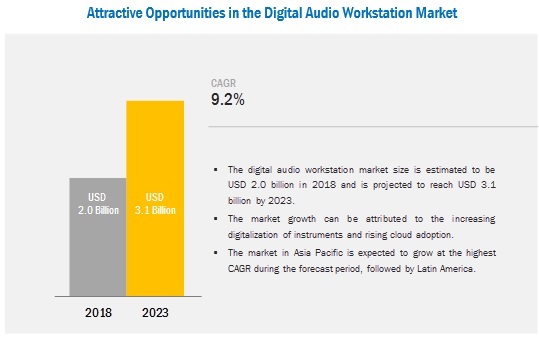 [130 Pages Report] The global digital audio workstation market size is expected to grow from USD 2.0 billion in 2018 to USD 3.1 billion by 2023, at a Compound Annual Growth Rate (CAGR) of 9.2% during the forecast period. The demand for digital audio workstations is expected to grow over the next 5 years, owing to several factors, including the increasing adoption of cloud-based digital audio workstations and growing digitization of instruments. 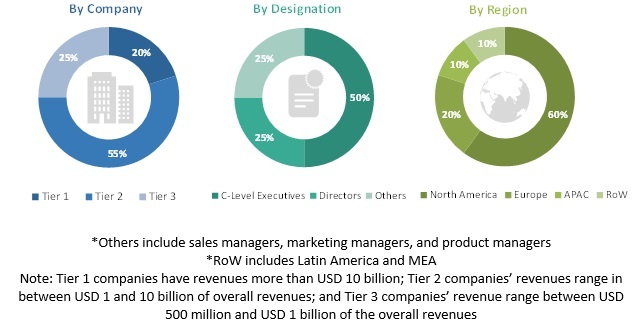 Increasing demand for AI-generated music, growing media & entertainment industry, and increasing adoption of Android-based operating systems are the key growth factors for the market. The editing segment is expected to constitute the largest market size during the forecast period due to the widespread adoption of digital audio workstation software across end users in different regions. It proves to be a vital solution for musicians to easily and quickly edit the audio files more effectively. Digital audio workstations provide a robust feature set for audio editing. The sets include basic functionalities such as cut, copy, paste, delete, and insert as well as advanced functionalities such as silence, auto-trim, compression, and pitch shifting. Digital audio workstations enable users to reduce noises in recordings, create noise-free music pieces, and restore audio. Increasing demand for Android-supported DAW solutions drives the key players to focus on developing such solutions. Android is noticed to be gaining a major share in the developing countries of Asia Pacific, specifically in China and India. The Android operating system offers better hardware support and more choices for applications at an affordable cost. It also provides easy and user-friendly interface. Hence, the Android-supported digital audio workstations are being widely used by independent music producers, hobbyists, and performers to refine their music at an effective cost. Audio engineers set up and test sound equipment before events, broadcasts, and recordings and help produce music by balancing and adjusting sound sources using equalization and audio effects mixing , reproduction, and strengthening of sound. Sound engineers are professionals who use digital audio workstations to record, edit, mix, and master music to improve sound quality and add sound effects to recordings. These workstations enable sound engineers to work with video editors and synchronize video with audio tracks. Developing regions such as Asia Pacific, Middle East & Africa, and Latin America have witnessed increased adoption of digital audio workstations by sound engineers for various applications. The global digital audio workstation market by region covers five major regions: North America, Asia Pacific (APAC), Europe, Middle East and Africa (EMEA), and Latin America. North America constitutes the highest market share, owing to the early adoption of advanced technology solutions as well as initiatives taken by vendors to reach the end user base. The US and Canada are witnessing increased adoption of advanced technologies, including Android and Linux operating systems. The digital audio workstation market comprises major vendors, such as Apple (US), Adobe (US), Avid (US), Steinberg (Germany), Ableton (Germany), MOTU (US), Acoustica (US), Native Instruments (Germany), MAGIX (Germany), Presonus (US), Cakewalk (US), Inage Line Software (Belgium), Bitwig (Germany), Renoise (Germany), and Harrison Consoles (US). The study includes in-depth competitive analysis of these key players in the global market with their company profiles, recent developments, and key market strategies. In March 2019, Avid renewed its multiyear agreement with FotoKem, a leader in digital and film post-production. The agreement ensures optimized efficiencies from Avid to enhance FotoKem’s video and audio post-production workflows. ProTools plays an important role in improving FotoKem’s audio post-production. In February 2019, Steinberg released maintenance updates for all Cubase 10 versions. The updates include enhancements for chord pads, MixConsole, expression maps, etc. In November 2018, Avid partnered with UVI, a developer of software instrument and effects & soundware. The partnership will enable artists to produce quality music efficiently through the combination of Avid Pro Tools and UVI’s Falcon. In January 2018, Adobe released Adobe Audition, version 11.0.1. This version offers 50 usability, performance, and stability improvements. The updates include smart input monitoring, which avoids issues with audio device configurations, enhanced auto-ducking stability, better channel mixer effects, etc. What are the opportunities in the market? What are the key trends in the digital audio workstation market? How are mergers and acquisitions influencing the market? The study involved 4 major activities to estimate the current market size of the digital audio workstation market. An exhaustive secondary research was done to collect information on the market, the peer markets, and the parent market. The next step was to validate these findings, assumptions, and sizing with the industry experts across the value chain through primary research. Both top-down and bottom-up approaches were employed to estimate the complete market size. Thereafter, the market breakdown and data triangulation procedures were used to estimate the market size of the segments and subsegments. In the secondary research process, various secondary sources, such as Hoovers, Bloomberg BusinessWeek, and Dun & Bradstreet, have been referred to for identifying and collecting information for this study. These secondary sources included annual reports; press releases and investor presentations of companies; whitepapers, certified publications and articles by recognized authors; gold standard and silver standard websites; Research and Development (R&D) organizations; regulatory bodies; and databases. Various primary sources from both supply and demand sides of the digital audio workstation market ecosystem were interviewed to obtain qualitative and quantitative information for this study. Primary sources from the supply-side included industry experts, such as Chief Executive Officers (CEOs), Vice Presidents (VPs), marketing directors, technology and innovation directors, and related key executives from various vendors who provide the digital audio workstation software, associated service providers, and system integrators operating in the targeted regions. All possible parameters that affect the market covered in this research study have been accounted for, viewed in extensive detail, verified through primary research, and analyzed to get the final quantitative and qualitative data. With data triangulation and validation of data through primary interviews, the exact value of the overall parent market size was determined and confirmed using this study. The overall market size was then used in the top-down procedure to estimate the size of other individual markets via percentage splits of the market segmentation. 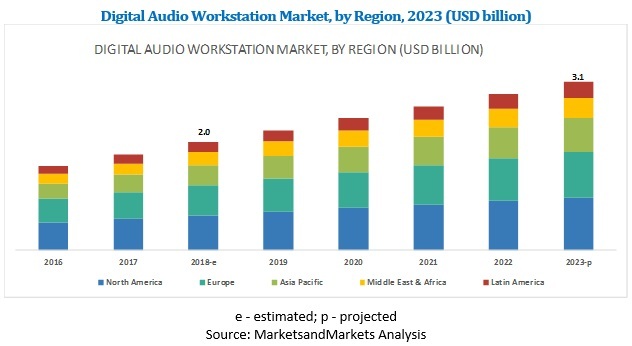 This research report categorizes the digital audio workstation market based on component, deployment model, type, end user, operating system, and region.